On this day in history, 2011, the space shuttle Atlantis launched from the Kennedy Space Center to deliver equipment and supplies to the International Space Station. 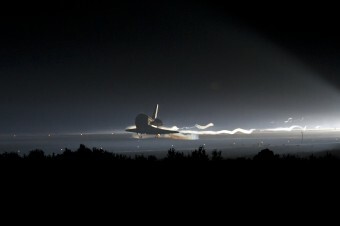 Atlantis touched down at 5:57 AM EDT on July 21, 2011, closing 30 years and 135 missions performed by the Space Shuttles. Throughout their run, a total of five space worthy shuttles were built, with the additional Enterprise prototype used for flight testing, but never upgraded to be able to fly in low orbit, as was initially planned (it lacked engines and did not have a heat shield, among other things). Two of the five space worthy shuttles were destroyed in accidents (Challenger and Columbia). The three surviving were Discovery, Atlantis, and Endeavour. The shuttle program was originally intended to last only 15 years, but due to the space station project evolving into the much more ambitious International Space Station project and a variety of other delays , the shuttle program lasted twice as long as originally anticipated. While the average cost of a specific Space Shuttle mission tended to be about a half a billion dollars, when factoring all aspects of the Space Shuttle program, which cost a total of $170-$180 billion, each of the 135 missions actually cost about $1.3 billion. The first launch of the Enterprise prototype was on February 18, 1977, attached to a Shuttle Carrier Aircraft throughout the flight. It had its first free flight on August 12, 1977 when it was detached from the carrier mid-flight to continue to test its flight capabilities. The first orbital test flight was accomplished with the Space Shuttle Columbia on April 12, 1981. Each shuttle typically held five to seven crew members, though in the final Atlantis mission, only four crew members were aboard due to the fact that no rescue mission would have been immediately possible by NASA. So, had a major problem occurred in orbit, the astronauts would have had to stay aboard the International Space Station and be taken back to Earth one at a time aboard the Russian Soyuz capsules. Although the main tank attached to the orbiter during liftoff was always discarded to disintegrate (and explode) in the atmosphere, it was actually designed to be able to stay attached to the orbiter and placed in orbit to possibly be reused, such as perhaps be integrated into the International Space Station. 83% of the thrust needed for liftoff with the Space Shuttle System was provided by the two rocket boosters attached to the main tank. These provided 12.5 million newtons of thrust each. The space shuttle was one of the first fly-by-wire systems (no direct mechanical or hydraulic interlinks between the controls and the control surfaces). To accommodate the potential for computer failure, which would then cause total loss of control of the control surfaces in a fly-by-wire system, the shuttle included five redundant 32-bit general purpose computers. Four of the computers would run the avionics software. Each of the computers would constantly check each other for failure. If one seemed to have failed, the others would remove it from the system. The fifth computer was used as a backup to the four computers, with different code to assure that if some bug in the code of the other four crashed all four, that it would not crash the fifth. During all 135 machines, the fifth computer and code was never needed. Amazingly, the five computers running the avionics system initially had only 424 KB of memory and the processors could only handle 400,000 instructions per second. This system was upgraded in the 1990s to have 1 MB of memory and a processor that could do 1.2 million instructions per second. For reference, a modern Intel i7 Processor can do a peak of about 177,730 million instructions per second. In addition to this, the main disk drives for the shuttles were magnetic tape cartridges, up until the 1990s. Why didn’t they just hitch up a covered wagon while they were at it? 😉 In the 1990s, they switched to a semiconductor based disk with a battery backup. Despite this system being so low powered by today’s standards, in terms of computer processing power and memory, the shuttles were fully capable of executing the entire re-entry procedure automatically, including landing. However, the landings themselves were almost always flown by hand, though the re-entry sequence was usually left to the computer to control. The Space Shuttles typically flew up to an altitude of 200 miles and sometimes would go as high as 400 miles. Their maximum altitude was 600 miles. NASA briefly considered converting one or more of the shuttles to passenger shuttles, capable of seating as many as 74 people with a proposed $1.5 million per seat for three days in orbit. Discovery was the first of the three shuttles to be retired. The final Space Shuttle mission was commanded by Christopher Ferguson, with Douglas Hurley as the Pilot, and Sandra Magnus and Rex Walheim as the Mission Specialists. As a reference for the general specs of the orbital modules of the Space Shuttle system, the Endeavour was 122.17 ft (37.237 m) long, with a wingspan of 78.06 ft (23.79 m), and a height of 56.58 ft (17.25 m). When empty, it weighed 127,000 lb (78,000 kg). Its maximum payload for launch was 55,250 lb (25,060 kg). It could hold as much as 32,000 lb (14,400 kg) when landing. The max total Space Shuttle System weight for take-off (including rockets, orbiter, payload, tank, fuel, etc.) was 4.4 million pounds (2 million kg). The space shuttle Atlantis was named after the two masted sailing ship Atlantis, which was run by the Woods Hole Oceanographic Institution from 1931 to 1964. Today it is still in use as a research vessel, having sailed over 1,300,000 miles and is the oldest ocean research vessel in the world.